This post was originally designed to close out Heisman Trophy week, but life intervened. After a brief delay, it’s time to revisit the most beloved Iowa football player of all – 1939 Heisman Trophy winner Nile Kinnick. One of the main reasons why Iowa fans love Nile Kinnick is because he was one of us. Nile Clarke Kinnick, Jr., was born on July 9, 1918, during the peak of World War I. Nile was the oldest of three boys born to Nile Clark Kinnick, Sr., and Francis Clarke. 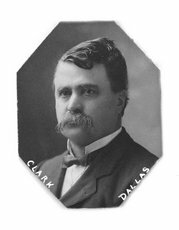 Francis’ father, George W. Clarke, graduated from the University of Iowa in 1878 and served for four years as the Governor of Iowa from 1912-1916, just before Nile was born. Kinnick was a typical Iowa boy growing up. He helped his dad on the farm and took a number of jobs that any young boy might, serving as a paperboy for the Des Moines Register and bagging groceries at the local supermarket. But Nile was atypical in many ways, and most of that stems from his upbringing. 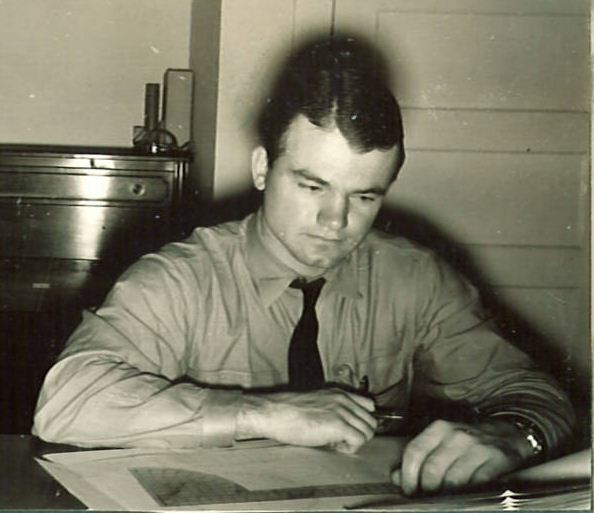 Nile Kinnick’s parents were devoted to the teachings of Christian Science, and from a young age, Nile began to display a strong work ethic and a solid moral background. His entire family would have long conversations around the supper table, discussing topics ranging from books to politics. Urged on by his parents, Kinnick constantly focused on personal self-development and strove to turn whatever personal weaknesses he found into strengths. While this was true intellectually, nowhere was this relentless self-improvement more evident than in his athletic career. Kinnick began showing his soon-to-be famed athletic skills early. He excelled at Adel Junior High School, participating in football, basketball and baseball. Kinnick’s junior high teams claimed undefeated seasons in both football and basketball. His 1930 Adel Junior High football team shut out every opponent they played. In eighth grade, he played on a Junior Legion baseball team with pitcher Bob Feller, who went on to have a Hall of Fame career with the Cleveland Indians. Nile then turned around and scored 485 points for the basketball team, leading them to the district finals. He taught himself to be ambidextrous with the basketball, and he had a nose for scoring. He scored more than a third of his team’s points in his junior season and notched over 1,000 total points in his three basketball seasons at Adel. After his junior year of high school, the Kinnick family moved to Nebraska. In the midst of the Great Depression, Nile Kinnick, Sr., gave up his farming activities when he was offered a job as a farm appraiser at a bank just across the river in Omaha. Nile would finish his prep career by competing for one year at Benson High School in Omaha. Kinnick was a first-team all-state selection in both football and basketball as a senior, starting alongside his younger brother Ben. He led Benson to a third place finish in the state basketball tournament and helped them to the city baseball championship. But Kinnick wasn’t gone from Iowa for long. After one year, he returned to the Hawkeye State and enrolled at the University of Iowa. He considered other schools, most notably the University of Minnesota. Nile even drove up to Minneapolis to see if the Gophers would be interested in him. Some have claimed that Bierman gave him a football tryout and deemed him unworthy, but that is unsubstantiated. In any event, the Gophers didn’t seem to have any interest in signing Kinnick. At 5’8″ and just 170 pounds, he certainly didn’t look the part. Many observers felt that Nile Kinnick and Iowa were destined for each other anyway, regardless of the Gophers’ interest level. “Kinnick was determined to go to some school that was down,” said Verle Davis, Kinnick’s football coach at Adel. “He didn’t want to go to Minnesota, because they were on top… He finally went to Iowa as he figured they were at their lowest ebb.” That account is persuasive, because it was true to Kinnick’s nature. To start from nothing and test himself against his own weakness as well as outside resistance were challenges Kinnick always pursued if they were available. In any event, Minnesota’s loss was Iowa’s gain, and Kinnick would become a superstar in Iowa City. Kinnick had always been an excellent student as well as an athletic leader, and he could have graduated in 1935, but his parents held him back a year to become thoroughly prepared for the university. It was a good decision, because Nile instantly excelled in both the classroom and the playing field. Kinnick was named the co-captain of the freshman football team. He also played baseball and basketball his freshman year. An unsung hero in the Nile Kinnick story is Coach Ossie Solem. Coach Solem had been the head coach at Drake University in Des Moines for over a decade before the Hawkeyes hired him as their football coach and athletic director in 1932. He walked into an exceedingly difficult job. Iowa had been suspended from the Big Ten for a month in January 1930 for alleged recruiting violations, and ever since, the Hawkeyes were the conference’s black sheep. Athletes stayed away from Iowa City like the plague. On top of all that, the Great Depression was taking its toll on the state of Iowa, and that had a profound impact on the state’s top university. The farming industry was in crisis, with Iowans going bankrupt left and right. Nile Kinnick served as an example of Iowa’s struggles, as Iowa’s lagging economy forced his father to flee the state in search of employment opportunities elsewhere. Despite that, Solem played an instrumental role in recruiting Kinnick and convincing him to join the Hawkeyes. Iowa lost all five of their Big Ten games in 1937. The most heartbreaking loss was a 7-6 defeat at the hands of Michigan, despite Kinnick’s 74-yard punt return for a touchdown. 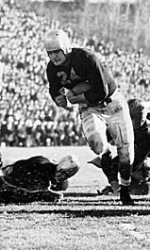 Kinnick was the lone bright spot of Iowa’s 1937 season; he led the nation in punting and was named first team All-Big Ten and a third team All-American. Nile also became a basketball standout. He dropped baseball early in his Iowa career, but he became a starter for the Hawkeye hoops squad in 1937-38 as a sophomore. Kinnick was a star on the court, ranking as Iowa’s second-leading scorer that year and placing 15th in scoring in the Big Ten. But after just one great varsity basketball season, he gave up the sport, stating that he didn’t want playing two sports to interfere with his studies. As far as sports were concerned, Kinnick was now a football man. In his junior season in 1938, Kinnick hurt his ankle in preseason football practice and reinjured it in Iowa’s first game of the year against UCLA. He was not at full strength for his entire junior year, and the amount of treatment he received for that injury has been a source of constant speculation ever since. Many observers think that Kinnick’s Christian Science beliefs limited the amount of medical assistance that he allowed himself to receive from the team doctors, believing that his injury could be overcome by his reliance on prayer for healing. However, at least one of his teammates later insisted that those claims were overblown and that Kinnick always went to the doctor and received whatever treatment he needed when anything was wrong with him. Whatever the case, Kinnick played through the pain, but it hampered his effectiveness. He was an honorable mention All-Big Ten selection his junior year in 1938, but he didn’t receive nearly as many accolades as he did during his outstanding sophomore season. After the 1938 season concluded, Coach Irl Tubbs was fired at Iowa. The new football coach would give the program new life and a new attitude…and greatness would follow. Dr. Eddie Anderson was hired as Iowa’s football coach beginning with the 1939 season. In his first year as Iowa’s coach, he guided the Hawks to the most romanticized season in school history, and a big part of that was the emergence of Nile Kinnick as the inspirational leader of the team. Coach Anderson liked Kinnick immediately. He referred to all of his players by their last names, except Kinnick, who was always “Nile”. Anderson favored student-athletes, because he felt that scholars made better players over the long run, and Kinnick was the perfect example of the type of leader Anderson sought. Coach Anderson believed the 1939 team could be a good one, but only if the starters played significant minutes. Before the first game, the Register noted that “a set of iron men may be developed to play football for Iowa.” After Iowa went 2-1 in their first three games, the Hawkeyes traveled to Madison to take on the Wisconsin Badgers. Iowa prevailed in a hard-fought contest, 19-13, but the Hawks were so short-handed due to injuries that Nile Kinnick and four of the other eleven starters were forced to play all sixty minutes. After the victory, newspapers started calling those victorious Hawkeyes “Ironmen”. The nickname for the team stuck. As the leader of the Ironmen, Kinnick played sixty minutes game after game and showed the durability and toughness that made the team famous. More than anything, Nile Kinnick was a clutch player. “In a game, you just knew he’d do something in the last minute, find a way to pull us out,” teammate Al Couppee recalled. And Kinnick almost always did. His last-minute heroics were first on display in that 1939 season in Iowa’s conference opener against Indiana. With only minutes to play, Iowa trailed the Hoosiers, 29-26, and faced a fourth and goal on Indiana’s 15-yard line. Kinnick pulled out the play of the game, firing a touchdown pass to Erwin Prasse to give the Hawkeyes the win. Iowa overcame a fourth quarter deficit in the Wisconsin victory as well. But the biggest comeback victory of them all was the win over Minnesota, when the Gophers led the Hawks, 9-0, going into the final quarter. Kinnick completed two fourth-quarter touchdown passes to Erwin Prasse and Bill Green, respectively, to lead Iowa to a breathtaking 13-9 triumph. Still, the Ironmen’s most famous win came, ironically, on Nov. 11, 1939 – Armistice Day. The Hawkeyes faced the undefeated Fighting Irish of Notre Dame, Coach Anderson’s alma mater, a team that was ranked #3 in the nation. Nile Kinnick’s second quarter touchdown and extra point were Iowa’s only points in the game, but it was all they needed, as the Hawks claimed a 7-6 victory. The photograph of Kinnick’s decisive touchdown run is one of the most memorable in school history. All in all, it was an incredible year for a program that had very little success during the 1930s. Iowa finished the year ranked ninth in the AP Poll with a 6-1-1 record. Kinnick was the team’s brightest star, throwing for 638 yards and 11 touchdowns on only 31 passes and running for 374 yards. He was involved in 16 of the 19 touchdowns (11 passing, 5 rushing) that Iowa scored and was involved in 107 of the 130 points that Iowa scored that year. Kinnick played 402 consecutive minutes from the start of the second game through the third quarter of the season finale against Northwestern, when he finally succumbed to a separated shoulder. All told, Kinnick set 14 school records, six of which still stand over 65 years later. 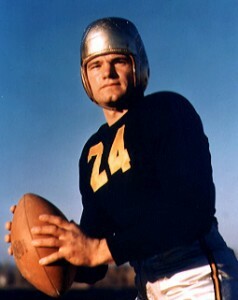 Nile Kinnick quickly became the most decorated athlete in school history, winning virtually every major award in the country. He was a consensus first team All-American, and he appeared on every first team ballot to become the only unanimous selection in the AP voting. He won the Big Ten MVP award by the largest margin in history. He also won the Walter Camp Award and the Maxwell Award as the most outstanding college football player in the country. 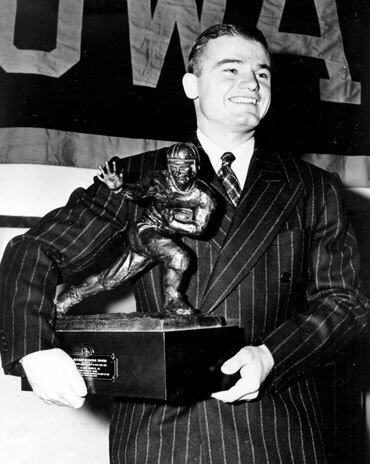 Nile Kinnick even won the Associated Press Athlete of the Year Award, beating out men like Joe DiMaggio, golfer Byron Nelson, and boxing’s Joe Louis; Kinnick was the first college football player to ever win that award. But his greatest college football honor was announced on November 28, 1939. 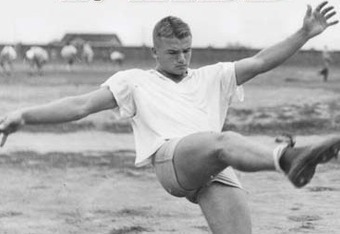 Nile Kinnick won the voting for the Heisman Trophy, becoming the first – and so far, only – Hawkeye to win college football’s most prestigious award. 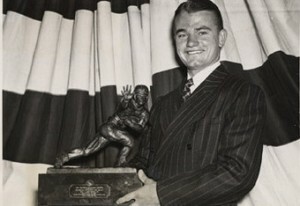 Kinnick immediately left for New York City to attend the banquet on December 6 and officially accept the award. Nile Kinnick’s speech accepting the Heisman Trophy has become the stuff of legend. He practiced other versions of that same speech while accepting awards like the Walter Camp Award, and when it was time to accept the Heisman, Kinnick was ready. Today, that statement is often misinterpreted as a respectful salute to military service by an athlete who is aware that there are larger, more important issues in life than sports. In reality, Kinnick, a Republican, was an isolationist who believed that the United States should stay out of the conflict in Europe. Kinnick was expressing his gratitude that he and all Americans weren’t over in Europe trying to fight the Germans. But the fact that he used his platform during an acceptance speech for a sports award to make an intellectual comment about issues of greater significance than athletics stunned observers, who were taken aback by his thoughtfulness. That isolationist attitude is one he would quickly reconsider just months later as the European conflict dragged on. Kinnick originally attended Iowa because he wanted to eventually go to Iowa’s law school, like his grandfather Gov. Clarke before him. After a year of attending Iowa law school (and serving as an assistant coach for two seasons under Eddie Anderson), he soon realized that he had a patriotic duty to protect the nation in an increasingly uncertain world. Well, every Iowa fan knows the sad end to this story. Kinnick died on June 2, 1943, on a routine training flight off the coast of Venezuela. He had been flying for over an hour when his plane developed an oil leak so serious that he could neither reach land nor the USS Lexington, whose flight deck was in any case crowded with planes preparing for launch. Kinnick followed standard military procedure and executed an emergency landing in the water. Rescue boats arrived on the scene a mere eight minutes later, but they found only an oil slick. Kinnick’s body was never found; he was just 24 years old. The state of Iowa was filled with shock over the loss of their state hero. Nile Kinnick was the first Heisman Trophy winner to die; he passed away less than eight years after the award was first established. In the nearly seven decades after his death, Kinnick’s legend has grown to epic proportions, and today he is remembered in Iowa as fondly as ever. Nile Kinnick has received so many posthumous honors that it’s almost impossible to list them all. Kinnick has become a fascinating and well-remembered subject for sports historians. Six books, including four non-fiction books, have been written about Nile Kinnick and the 1939 Ironmen. An Iowa City theater produced a play based on Kinnick’s life, and Kinnick has been the subject of numerous documentaries and television retrospectives. For years, people have said the coin flipped at the start of every Big Ten football game bears his image. I knew that was true at one time, but I wasn’t sure if that was still the case or if it was just something people continued to say. A friend of mine recently called the Big Ten offices and confirmed that, yes, Kinnick coins are still used today to open every Big Ten football game. Yet Kinnick’s legacy extends well beyond typical Big Ten country. Incredibly, when the United States occupied Japan after World War II, it renamed the main venue intended for the 1940 Summer Olympics “Nile Kinnick Stadium.” Furthermore, a high school in Yokosuka, Japan, for dependents of military personnel is named Nile C. Kinnick High School. 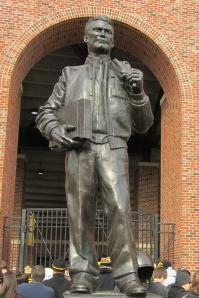 Nile Kinnick has been honored throughout college football. He was one of two Hawkeye players (Duke Slater) to be inducted into the College Football Hall of Fame in the Hall’s inaugural year in 1951. College Football News ranked Kinnick as one of the ten greatest college football players ever. In 1999, Sports Illustrated selected Kinnick as the third greatest sports figure in the history of the state of Iowa, behind only Dan Gable and Kinnick’s youth baseball teammate, Bob Feller. But it is the Hawkeye football program that has held Kinnick nearest and dearest to its heart. Kinnick’s #24 has been retired, one of only two players (Cal Jones – #62) so honored. In 1989, Iowa fans selected an all-time University of Iowa football team during the 100th anniversary of Hawkeye football. 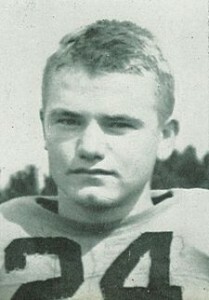 Not only was Kinnick selected to the team as a halfback, he was voted the team’s MVP as the most valuable player in the first century of Iowa football. Of course, none of these honors can compare to the school making Nile Kinnick the namesake of the team’s football stadium. There was considerable sentiment to honor Kinnick in this way after his death in 1943, but his father, Nile Kinnick Sr., was not comfortable with the idea. Nile Sr. stated that his son was just one of 407,000 Americans who lost their lives in military service during World War II, a tally that included Nile’s younger brother, Ben. As a result, Nile Kinnick, Sr. did not think it was appropriate at that time to single his son out for such an honor. The school reluctantly honored Mr. Kinnick’s wishes. In the early 1970s, Gus Schrader, sports editor of the Cedar Rapids Gazette, resurrected the idea. He used his popular column in the paper, Red Peppers, to rally support for the cause. The movement began to gain support, most importantly when Nile Sr. softened his position and indicated he would not stand in the way of putting his son’s name on the stadium. Nile Sr. appeared to be very appreciative that his son was fondly remembered so long after his death, so he gave his endorsement to the movement to name the stadium after Kinnick. 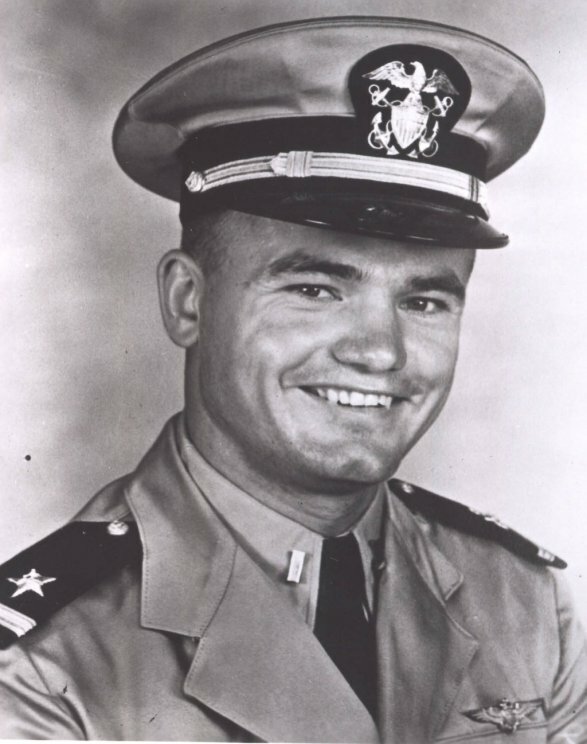 Nile Kinnick’s father, Nile Sr., was very close to his son. They had frequent written correspondence and Nile Sr. was a major influence in young Kinnick’s life. Yet Mr. Kinnick was very humble, and he was very careful to never do anything that might be seen as taking attention away from his son. He was always quick to mention Nile’s teammates on that 1939 Ironmen team whenever anyone praised his son’s football achievements. Mr. Kinnick, who outlived two of his sons by nearly fifty years, lived long enough to see his son given Iowa football’s highest honor. In the spring of 1972, the Iowa Athletic Board voted to rename the stadium in honor of the school’s only Heisman Trophy winner. The Hawkeyes’ first home game that year was with Oregon State, and a pre-game ceremony on September 23 made it official: Iowa Stadium became known as Kinnick Stadium. Nile’s father took part in the ceremony and seemed genuinely pleased. It’s pretty hard to believe, but Kinnick Stadium is the only college football stadium named for a Heisman Trophy winner. In 2006, Iowa finished stadium renovations that greatly increased Kinnick’s presence there; the school dedicated a 14-foot bronze statue of Kinnick in front of the stadium and placed a nine-foot by sixteen-foot bronze relief on the wall of the stadium, depicting Kinnick’s 1939 game-winning touchdown run against Notre Dame. Nile Kinnick was a Hawkeye through and through, a fact that was reflected in his final words. After news of Kinnick’s death was made public on July 3, 1943, a female friend of Nile’s received a letter the postman had previously overlooked. It was the last letter ever received from Nile Kinnick. Nile was responding to a letter she had sent him, detailing a trip she took to Iowa City. Eloquent and memorable words befitting the most decorated and beloved student-athlete in Hawkeye history.